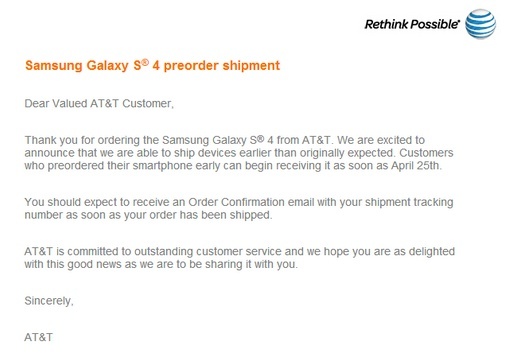 If you pre-ordered your Samsung Galaxy S4 from AT&T, you may have a wonderful surprise waiting inside your inbox this afternoon. AT&T is notifying customers that they are able to ship devices earlier than originally expected, with some arriving as early as April 25. We were sort of expecting the arrival and launch date to be April 26, but hey, we’ll take anything from Samsung’s flagship line a day early. 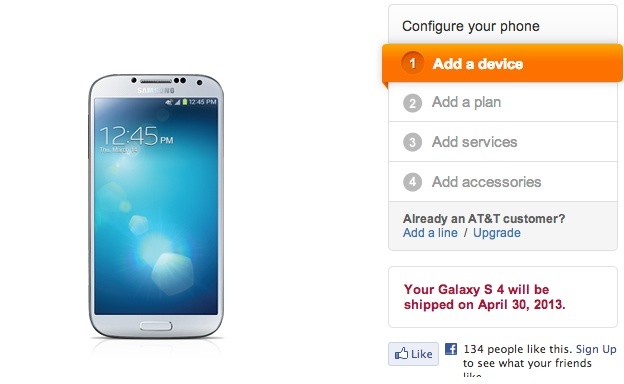 Also, we should point out that AT&T’s site is showing the Galaxy S4 as shipping April 30, so that could potentially be the official launch date, which they have yet to supply us. Update: AT&T Tweeted that April 27 is actually the in-store launch date. We’re continuing to keep track of official Galaxy S4 availability here.